I love going through my kid's school papers and finding these little treasures. 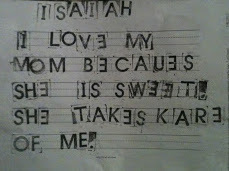 This one my sweet Isaiah actually pulled out of his folder and brought to me himself. All shy grins and red cheeks. Isn't it just precious? As I read it again tonight, the first part seemed a little familiar. 1 John 4:19 We love because... of course the scripture goes on to say (because) He first loved us. Let me just stop for a minute to say, there have been times in my life when God is "working on me" so to speak and though it's hard, I love it. I grow, my relationship with God grows and life is good. This past year, as far as God's work in my life... it seems to be one nasty revelation after another. It's like somebody is holding up a mirror in front of me. But instead of being one those fabulous Gap mirrors that make me look amazing in their clothes (until I get home). It's more like a carnival mirror. I look ugly, distorted - I'm not liking the reflection. The image I saw of myself this evening was no exception. My post last week was all about love. I even talked about the concept of loving others because of God's love for us. But here's how I think this verse reads in my real ugly life, "I love because God takes care of me." And He does, and I do take care of Isaiah and this is a fabulous way to show love, to feel love. But during a year filled with disappointments, frustrations and a complete lack of understanding on my part - if I am being honest, I have not been feeling the love for God. I love God, dearly when He is sweet and taking care of me. But when God's plan does not seem to be in my best interest, I'm only slightly fond of Him. That stupid carnival mirror popped up in front of me again tonight when I was reading the bible to my kids. Do any of you other parents get more out of these simple children's bibles than your own grown up version? Please tell me it is not just me. As the story told of Gabriel appearing to Mary to tell her she would give birth to the Savior, these simple little words, "So Mary trusted God more than her eyes could see." just kind of reached up off the page and slapped me in the face. Oh to have Mary like faith. To trust more than what my eyes can see. And to say, even when I don't quite get God's plan, I love you, period. I use to be there. It was the story of my life, the soap box I preached from. Apparently the fall that came from that pride was far and hard. It's like God said, "Oh really?!" and then brought me to my knees. Sometimes being human is a drag. Lord, I want to love, because you first loved me. I want that to be enough. Help me to trust beyond my own understanding. Get me back to the place where I know, beyond a shadow of a doubt that you are in the deep trenches with me, working, and bringing glory to your name - and precious growth to my life. P.S. I LOVE comments! Click right here this link to leave one, I would love to hear from you. So what is God doing in your life? I want to hear all about it. Share what God is teaching you, a verse, a talent He has given you (crafts, photography, home decor...) Anywhere you can give God glory in the world around you, please link up and share it here. Life Is Hard But There's A Simple Answer!